Is the popularity of charity shopping because of the rising backlash against fast fashion Or the excitement of finding a one-off bargain? I feel there was once a stigma to shopping in charity shops, but it feels like the tides have turned and are now seen as the perfect place to hunt down a suitably unique bargain. And for that reason I’m such a lover of charity shopping! Last year I found an amazing gem in the charity shop FARA which is a charity shop near me in Belsize Park (although they are popping up on most high streets now). When I do my monthly wardrobe throw out, if I don’t up-cycle the old clothes for LALLAXRR I will donate it there. I feel it’s important to donate to charity shops, making your trash someone else's charity shop treasure! FARA Charity transforms the lives of vulnerable and disadvantaged children and young people in Romania so it really is a great cause. In FARA Charity shops you can expect to find a wealth of designer and high end High Street wear, which is where I found the most AMAZING long black Puffa Jacket! So on trend, these on the high street cost up to £200 so I was really happy to get them for £25.00. It’s perfect for the cold days ahead. Back in June last year, I was out in central London and came across the Cancer Research charity shop in Marylebone, a charity shop rumoured to be a celebrity hotspot frequented by Kate Moss and Sienna Miller. I noticed that this charity shop had a amazing mix of designer names on the rails, from Dior to Miu Miu to name a few. One of the things that excite me the most about charity shopping is that you just never know what you are going to find and the downside to this is that you can walk away empty handed but you've had a good time going for a good hunt! 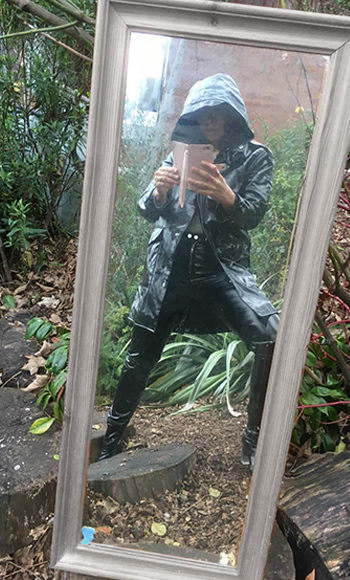 Through the designer mix I came across a Black PVC Zara Raincoat Mac,  so unique it’s a piece on its own and a complete bargain at £20.00. At the end of last year I popped into my favourite charity shop All Aboard on Finchley Road, this Charity shop helps raise money for numerous Jewish charities across London. This particular charity shop stands out as a mixture of second hand clothes and vintage pieces! Vintage gems that you would normally see in thrift stores in Camden or Portabello market.. With it being cold I was attracted to the jacket section in All Aboard first and was excited when I came across this completely unique one of a kind Quilted Jacket, it’s so different, you will only find this in a Designer shop for £200-£30 and the best part was it cost £20!!! Feb 1 Is Casual All It’s Cracked Up To Be ?